My right hand's too broken in to switch back to mousing with my left hand, but no PC gamer ever needs to know the right-handed prejudice I've suffered: Behold, the Razer DeathAdder Left Hand Edition. There've been other left-handed mice, yeah but none that are really gaming mice—you know, with a ridiculously sensitive tracking, macro buttons, and the other perks you expect from a gaming mouse. (Ambidextrous mice don't count.) A mirrored version of the DeathAdder, it's got the same 3500dpi sensor with 1000hz polling, braided cabling, and five programmable buttons. I talked to Razer's CEO Robert Krakoff—a leftie himself—about the mouse for a bit, and as you might suspect, the market for a left-handed gaming mouse is a sliver wide: Just 10 percent of the population is left-handed, not all of 'em are gamers, and a lot (like me) are just plain used to mousing right-handed. So, Razer actually expects to lose money making these, since they're selling them for the same price as the right-handed version—$60, MSRP, but you'll probably be able to find it cheaper retail. Also, he told me that since Razer's now making Mac drivers for all of their gear, expect their Mac-centric products to fade away, since every mouse and keyboard they make is for Mac now—with Steam coming to Mac, not bad timing at all. 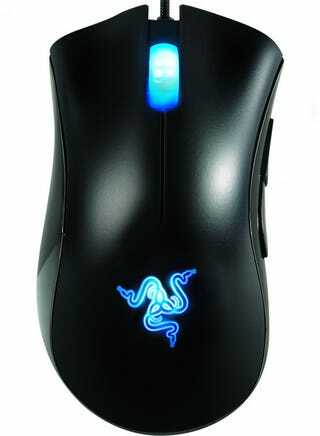 Carlsbad, Calif. – March 16, 2010 - Razer, the world's leading manufacturer of high-end precision gaming and lifestyle peripherals, today announced the Razer DeathAdder Left Hand Edition™, the very first gaming mouse designed with the professional left-handed gamer in mind. The Razer DeathAdder Left Hand Edition was created to meet community demands for a mouse that was purposefully engineered to give lefties the competitive edge, combining a comfortable ergonomic form factor with a powerfully precise 3.5G infrared sensor. The Razer DeathAdder Left Hand Edition features a unique ergonomic form factor to give lefties a comfort they can call their own for extended gaming sessions. The Razer DeathAdder Left Hand Edition boasts five programmable Hyperesponse™ buttons, as well as the trademark 1000Hz Ultrapolling™ technology, providing gamers with the speed necessary to make every moment count. Loaded with a 3500dpi Razer Precision™ 3.5G infrared sensor that offers over four times more precision than a standard 800dpi mouse, the Razer DeathAdder Left Hand Edition is fully equipped to frag, especially when you strike from the blind side.